Kick off your visit on the 30th (Sun): take in nature's colorful creations at Roma Street Parkland and then let little ones run wild at South Bank Parklands. 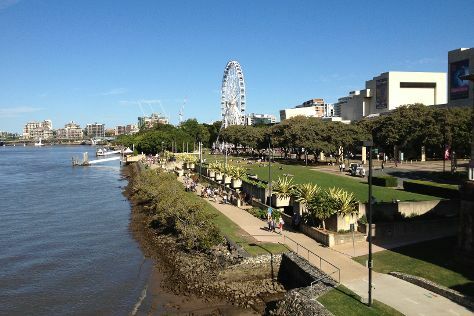 For maps, ratings, photos, and other tourist information, go to the Brisbane trip maker . New Delhi, India to Brisbane is an approximately 18.5-hour flight. The time zone changes from India Standard Time (IST) to Australian Eastern Standard Time (Queensland) (AEST), which is usually a 4 hour difference. In June, Brisbane is colder than New Delhi - with highs of 24°C and lows of 13°C. Finish your sightseeing early on the 30th (Sun) so you can travel to Port Douglas. On the 1st (Mon), see some colorful creatures with a scuba or snorkeling tour. Plan my Port Douglas trip by asking Inpirock to come up with tips and suggestions. Traveling by combination of flight and shuttle from Brisbane to Port Douglas takes 6 hours. Alternatively, you can do a combination of bus, flight, and shuttle; or drive. Plan for somewhat warmer temperatures traveling from Brisbane in July, with highs in Port Douglas at 30°C and lows at 20°C. Finish up your sightseeing early on the 1st (Mon) so you can go by car to Cairns. Kick off your visit on the 2nd (Tue): see some colorful creatures with a scuba or snorkeling tour. To see photos, where to stay, more things to do, and more tourist information, go to the Cairns sightseeing planner. You can drive from Port Douglas to Cairns in 1.5 hours. Other options are to take a bus; or take a shuttle. In July in Cairns, expect temperatures between 30°C during the day and 20°C at night. Wrap up your sightseeing by early afternoon on the 3rd (Wed) to allow time for travel back home.